the middle part of this piece was done separately. i have a series of sketchbooks that i had made 2d collages in. every now and then i take out one of my earlier works and incorporate it into a new art piece. since my "style" of work changes as time passes i like to use the "old" with the "new". this keeps me in my original 2d collage roots and yet refreshes the piece into something different. maybe i should change the name of the series to "transformation"??? 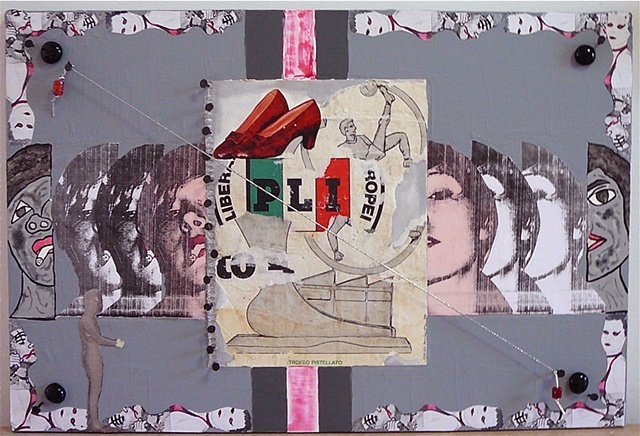 actually the "inside" collaged piece is "billboard" from italy and the "pink face" is torn from a billboard in new york. so it's a "double billboard". i just realized that...it was unintentional, but i like the "double" effect. since i didn't realize this when creating this piece this underscores how i do my art...it is often "unconscious"...i never know from whence it comes! This is wonderful! I love the contrast of grey and pink, the repetition and the rough, xeroxy elements. Another favorite. Love the composition here. like a piece of dynamic Pop-Art... brilliant. That's very 70's i mean and red shoes maybe from 50's. Make me think to the Velvet underground. Hello Jennifer. hai sempre un imaginazione grande!!!Brava! powerful as all of your work! congratulation! Me encanta este collage !!!!! Fantastic work !!! Wonderful composition !!! I like your surrealistic lines in your works.Excellent! I don't recall seeing this before! Great use of imagery. So lovely & modern style. Happy New Year, Jennifer. hello jennifer. I like the feeling tone of this one. The repetition creates kind of a stutter effect that appeals. Love your artwork here, Jennifer..
Ahhh, yes Italian shoes and models new and old.